The photo above looks dramatic! 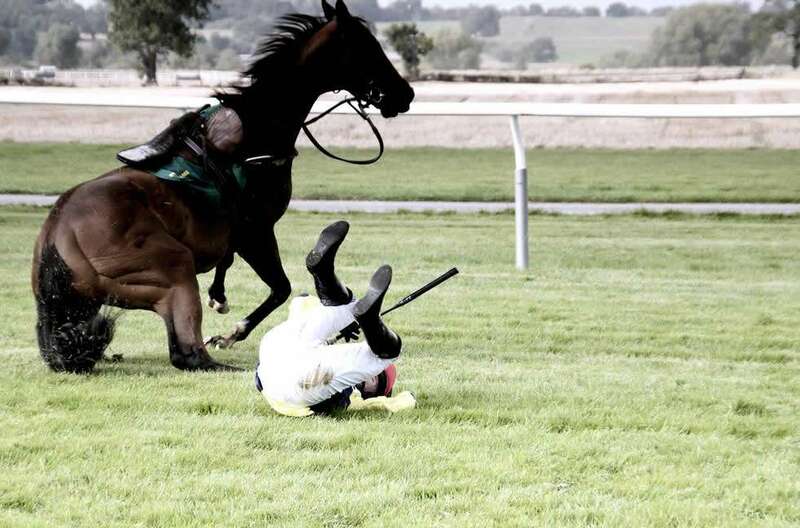 It seems to confirm the perception that National Hunt racing can be a cruel sport, and there is no doubt that this type of racing carries more risk than running on the flat. However, it may surprise you to know that moments after this picture was taken both horse and jockey were walking back to the grandstand. I know because I took the photo at Bangor-On-Dee racecourse. These words, spoken by Mick Fitzgerald, jockey and former Grand National winner, were used to describe how chequered flags were waved by track officials as jockeys approached the 20th and 22nd fences in the 2011 Grand National. Mick, commentating on the race for the BBC, was accused of callousness by viewers as the two ‘obstacles’ he was talking about were two dead horses – Ornais, who fell at the fourth fence, breaking his neck, and Dooneys Gate who broke his back only minutes later at Becher’s Brook. 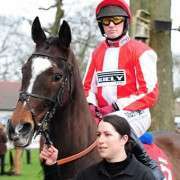 On average the three-day Grand National meeting sees the accidental deaths of three horses each year and the world famous Grand National steeplechase itself, held on the final afternoon, has led to the deaths of 22 horses since 1984. To put that number into context over 1000+ horses have completed the Grand National course in that time. 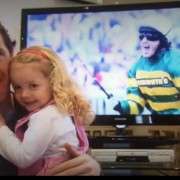 But no sport is without risk, whether it is formula one, figure skating, or even cheer leading – which is reported to be the number one most dangerous sport! However, animal rights campaigners and a proportion of the public say the race is cruel, and shouldn't be allowed. On the other hand race organisers work hard to make sure that the horses are as well cared for and safe as possible. Horses have been used in sporting events since ancient times. Both the Greeks and Romans raced horses, and of course most of us will have seen the wildly exciting chariot race in Ben-Hur. Since then horses have been used in all manner of equestrian sports – horse jumping, polo, harness racing, even the bucking bronco of the rodeo. But whilst most of these sports continue almost without comment, it is horse racing and particularly the Grand National which causes the most controversy. The National attracts massive crowds, whilst millions more sit watching the action on their television screens. A staggering one in three adults in the UK has a flutter on the race and in offices and factories all over the county sweepstakes are organised as a bit of harmless fun. Many believe that animals enjoy the healthy competition as much as humans and one estimate claims that if it wasn't for steeplechase racing, a third of the thoroughbred population in the UK would have to be slaughtered in a massive cull. So is horse racing really cruel, or is it just one more way that humans and animals can work together to mutual benefit? One expert has called the National “the most severe test of horse and rider ever devised” and it probably is. But many people believe that it isn’t simply a test, but a cruel and dangerous activity that should be made much safer or stopped altogether. In a recent Guardian poll 58.8% of people who voted said that the race was too cruel and in an open letter to the newspaper, eight celebrities – Brian May, Alesha Dixon, Richard Adams, Gemma Atkinson, Emma Milne, Sue Cook, Bill Oddie and Mark Radcliffe – called for the public to boycott the horserace, lending their support to a campaign by the animal welfare charity, the League Against Cruel Sports, for major improvements to be made. 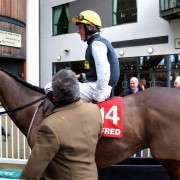 In answer to these and other concerns the British Horseracing Authority (BHA) recently led a review into the Grand National and published 30 recommendations to improve the safety of the race. Among these recommendations are two that state that the age of horses eligible to enter the Grand National should go up from six years to seven years and that jockeys must have won at least 15 races, 10 of which must be steeplechases. Obviously by improving the experience of runners, both horse and jockey, it should lead to a reduction in incidents. So as always, the safety and welfare of both horse and jockey remain the number one priority, but what would the world be without the magic of The Grand National? Much is being done to retain that magic whilst simultaneously making the race safer. 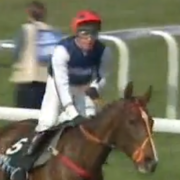 After the Ornais and Dooneys Gate tragedy, both Becher's Brook and the fourth fence were omitted from the second lap as commented on by Mick Fitzgerald. Earlier this year it was announced that the height of both fences will be changed for the 2012 race, lowering them to make the race safer. Further recommendations from the BHA’s review include a review and improvement of some pre and post-race procedures, the bypassing of fences to continue with customised equipment, and the improvement of the processes for identifying and responding to poor weather and the risks that it sometimes poses. The review group consulted with a wide range of experts: the Aintree veterinary team, jockeys and the Professional Jockeys Association, and trainers and welfare charities including the RSPCA and World Horse Welfare. So, whilst all risk can never be eliminated completely, improvements are being made quickly to ensure that there is as little danger as possible to both horse and jockey alike. In the future the National will be a safer, less risky race, where horses and jockeys can perform with the magic that the public has come to expect and love. I think that we can all be sure that Dads will be placing fifty pence bets for their children on National day and that offices all over the country can expect to draw their sweepstakes for a long time to come. http://www.grand-national.me.uk/wp-content/uploads/nationalcruel.jpg 648 981 Simone Wright http://www.grand-national.me.uk/wp-content/uploads/gn-logo2016green.png Simone Wright2011-12-21 12:42:532014-11-19 10:53:56Is the Grand National Cruel?